How Do You Approach Your Network to Let Them Know You’re Looking (without Looking Desperate)? 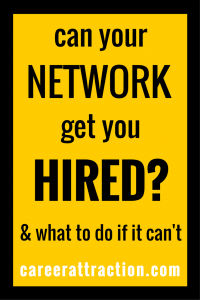 25 Feb How Do You Approach Your Network to Let Them Know You’re Looking (without Looking Desperate)? You’re in a pinch. Pink slips are being handed out left and right, and you just know yours is next. 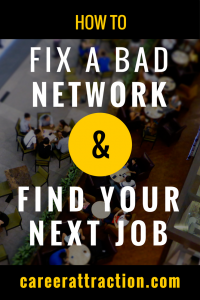 You know that the common advice is to approach your network when you need a new job to see if your connections know about anything, but what does that even mean? We all know the importance of maintaining a vibrant network. In fact, this is something we cover pretty frequently around here. But just how valuable is a solid network, really? Why does it matter? Well, how valuable is having a job you love? LinkedIn took a survey last year that demonstrated (via thousands of responses) that networking is the primary way people are finding these jobs these days. In fact, networking landed to a jaw-dropping 85% of new jobs for these survey respondents. Imagine being laid off on Friday morning and having a new job lined up by the following Monday. That is the power of a solid network. And yet, many people neglect their network until they need something from it. And when that day comes, it’s crickets and question marks instead of connections and job leads. The “personal network” becomes a commodity, a tool in the toolbox, a potential transaction instead of the living, breathing organism it should be. This is an enormous mistake. You can’t just ignore all your contacts and then suddenly show up looking for help when you’re out of a job. That’s not how it works in personal relationships, and it’s certainly not how it works in professional relationships, either. If you’ve left your network out to dry, the first thing you need to do is admit that there’s a problem. Even if you don’t anticipate looking for a job any time soon, you need to dust off your connections and start cultivating a powerful network that will come through if and when crunch time happens. The best thing you can do to approach your network today, before you need it, is to start approaching your professional contacts the way you might approach your friends and relatives. You don’t need to start going on vacations together, but you do need to start being intentional about developing a real relationship, one that grows over time. Think of your network not as a group of contacts but as a sea of potentially great relationships. They don’t necessarily have to be deep relationships, but they should be warm ones. It may seem like a lot of work “keeping in touch” with everyone around you, but it doesn’t actually require a significant investment of time or energy to do this. All it takes, really, is one good conversation and then the occasional follow-up. When you make a new connection, don’t think of this as another business card to add to the stack on your desk. Instead, really take a moment to connect with the person on the other end of the handshake. What does he do and what problem is he solving in the world? What are some things that matter to her and do you have any shared interests? Figuring out where your common ground is helps build rapport, and developing an awareness of their goals and priorities gives you key insight into how to build this relationship. When you know what’s important to someone, you’ve discovered the best ways you can help. The name of the game is nurturing. Once you’ve connected with someone, found the common ground you share, and discovered their primary goals and aspirations (especially when it comes to work, but not necessarily), you’ve got something to work with. The first thing you can do, especially if remembering these details doesn’t come easily for you, is to write them down. A good tip is to jot some key notes on the back of the person’s business card. Connecting on LinkedIn is another good step, because you’ll have access to their profile (and their photo) which can help you not only remember the name, face, and story together, but may also give you additional insights into their career activity. Keep nurturing the connection over time. It doesn’t have to be a constant stream of contact, either. Just do something to reach out whenever that person crosses your mind. It could be as simple as sending an interesting article about their industry with a question or two. Mention something you’ve learned that reminds you of their experiences. Check in and see if they’ve been able to meet that major milestone or land that promotion or project they were after. Possibly the most valuable thing you can offer someone is a great connection. Start looking for ways that you can connect people who don’t already know each other but who might value the connection. For example, next time you have people over, introduce your friend who just passed the bar to another friend who’s been practicing law in a major firm for several years. If you learn in passing that someone is trying to find work in a particular role or industry, make a connection between that person and a buddy of yours who is already in that position. Just a simple email may be all it takes. This may seem like a lot of giving on your part, but trust me: it will absolutely be worth it in the long run. By building up a “bank” of social capital through your network, you’re not only working to improve the careers and lives of others — which is incredibly valuable and satisfying in and of itself — but you’re creating a resource for yourself that will be priceless when you find yourself in need. Just imagine losing the security of your current job, whether you’ve just been passed over for a promotion, there’s a buy-out going on, or you’ve even been laid off and are out of work. When you’re on your own, you’re truly on your own. But when you’ve got a solid network of people who know you, like you, and are willing to help you (because you’ve shown up and helped them when you could), you’ve got a team of support. And not only support, but more contacts. After all, as the LinkedIn study proves, it’s not about who you know… it’s about who they know. And if you know a lot of people who are willing to connect you to their own networks, you aren’t just showing up “cold” and asking for handouts… you’re simply in a position of reciprocation. And that is how you’ll be positioned well to approach your network when you need (or want) a new job and (most likely) find something absolutely fantastic.